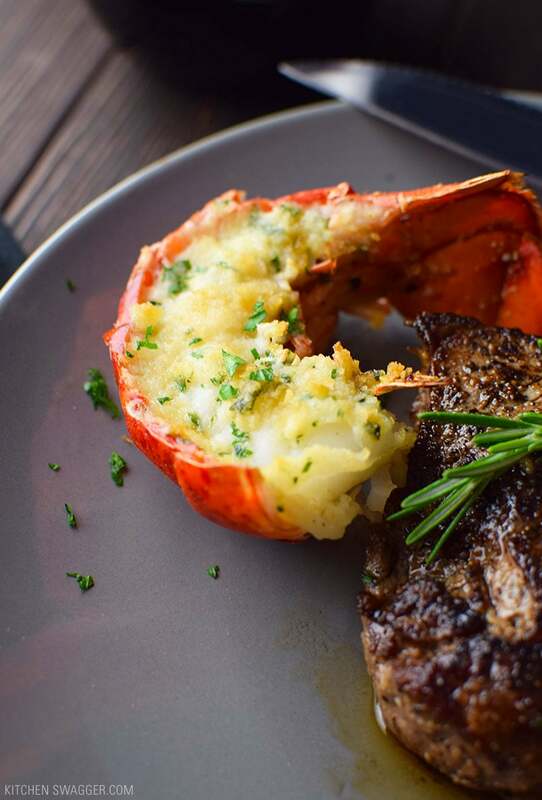 WOW, Surf and turf has never been so easy. I’ve got it, one of my new favorite celebration meals. 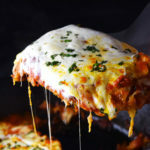 Potentially one the best recipe finds I’ve come across in quite some time. As much as I hate to say it, it all started with an infamous Buzz Feed Tasty video. 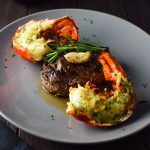 The video was an easy surf and turf recipe for two, consisting of baked, buttered lobster tails and a reverse seared strip steak cut in half. The recipe looked very simple, however I think I made it even simpler by using the swagger method to prepare the steak. Things I typically worry about? How do I make sure everything on the plate is done at the same time with one small oven? Buzzfeed’s particular recipe called for a reverse searing of the sirloin steak. 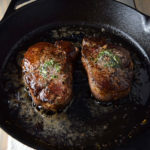 Rather than doing a sear first in a skillet and then finishing the steak in the oven, they actually bake the steak first and THEN finish with a stove top sear. To each their own, but I think I found a better way to simultaneously cook both the lobster and the steak in the oven at the same temperature – I think the recipe flows better this way. For me, simplicity is key. 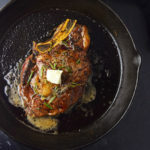 I prepare all of my steaks in a cast iron skillet using butter. For this particular recipe I seared a NY strip steak, cut in two for two minutes per side on the stove top and then transfer to an oven at 425 degrees for 5 minutes. 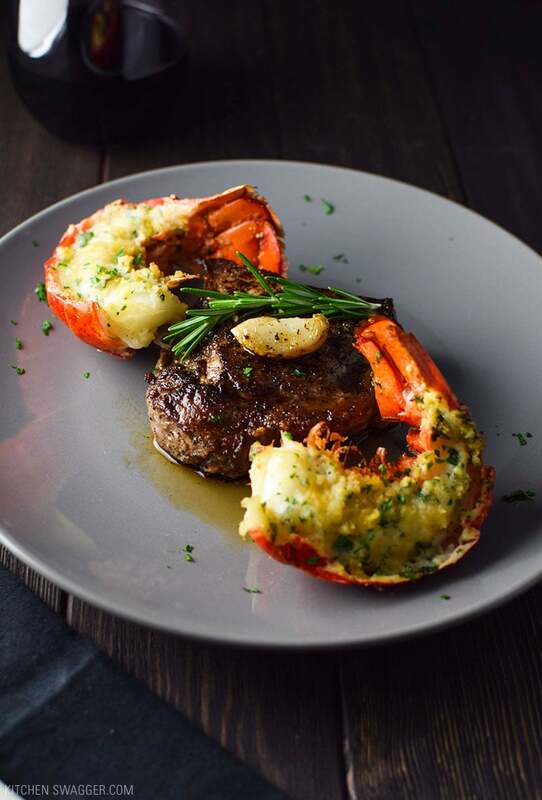 The beauty of this recipe is that you can simultaneously bake the lobster tails on the bottom rack the moment you the steak hits the skillet. A truly simple take on surf and turf for two that won’t break the bank or require four arms. I think everyone knows the lobster tail is the best part of the lobster. The tails are cut in half before baking and basted with garlic, butter, grated Parmesan cheese, fresh parsley, and sprinkled with crushed Ritz crackers. No cracking shells and no mess. The steak is finished off by drizzling garlic and rosemary infused butter over the steak. Super simple and guaranteed to impress. Now, if you’re looking to really ramp up your steak, I suggest you dive into the world of 100% grass fed beef. PRE’s grass fed beef is by far my favorite. You can order it online by following this link here. 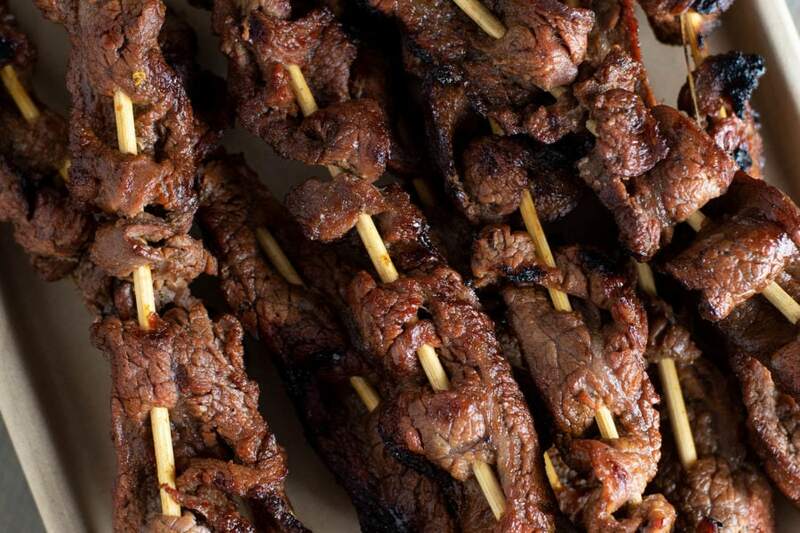 Grass fed beef is leaner, juicer and more difficult to overcook. Give it a try and let me know what you think. Side note, grass fed beef cooks 30% faster than non grass-fed beef, so you may want to subtract a minute from the cook times specified below. Remove the steak from the fridge 30 minutes before cooking, this is to bring the steak to room temperature and ensure your cooking times are more accurate. 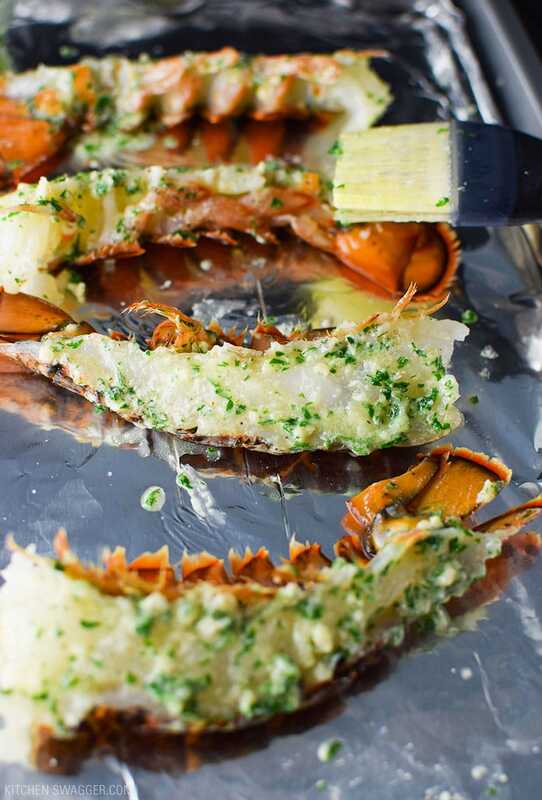 Using a sharp knife, pierce the top side of the lobster shell down the center of the tail. Cut into halves and set aside (keeping lobster in the shell). 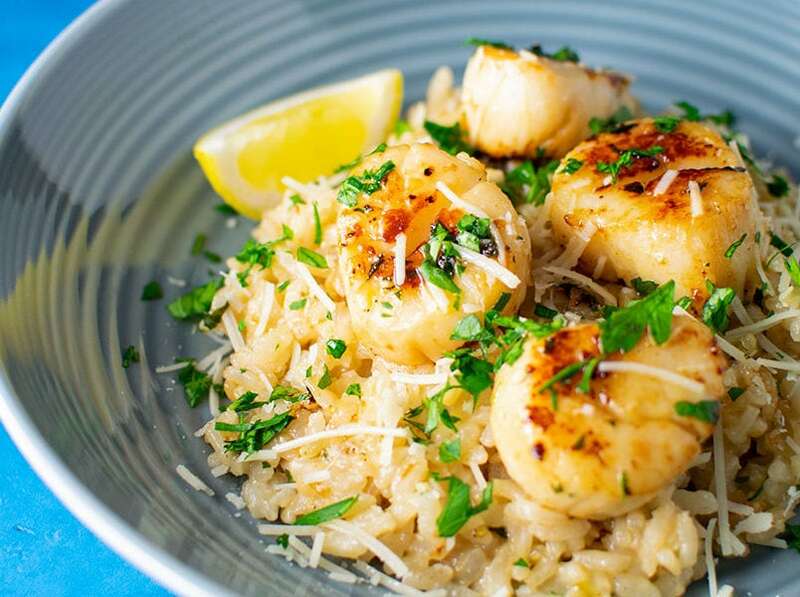 Combine 2 tablespoons of melted butter, Parmesan cheese, garlic, olive oil, parsley, salt and pepper in a small bowl. Stir until combined. Liberally baste the lobster tails and place on a baking sheet flesh side up. Sprinkle with crushed Ritz crackers and set aside. Cut the strip steak in half widthwise, season both sides generously with salt and pepper, and set aside. Add 2 tablespoons of butter to an oven safe cast iron skillet and turn up high, allow the skillet to become very hot first. At this time, add the lobster tails to the oven and bake for 15 minutes. Place the strip steaks face down and sear undisturbed for 2 minutes. Flip the steaks and sear for an additional 2 minutes. This will give your steak a nice seared edge. Add a clove of garlic and a sprig of fresh rosemary and immediately transfer your skillet directly to the oven. [WARNING] skillet may be hot, handle with oven mitts. For rare, bake for 4-5 minutes. Medium rare, 5-6 minutes. Medium, 6-7 minutes. Remember, depending on the size of the steak, the more or less time it will take. 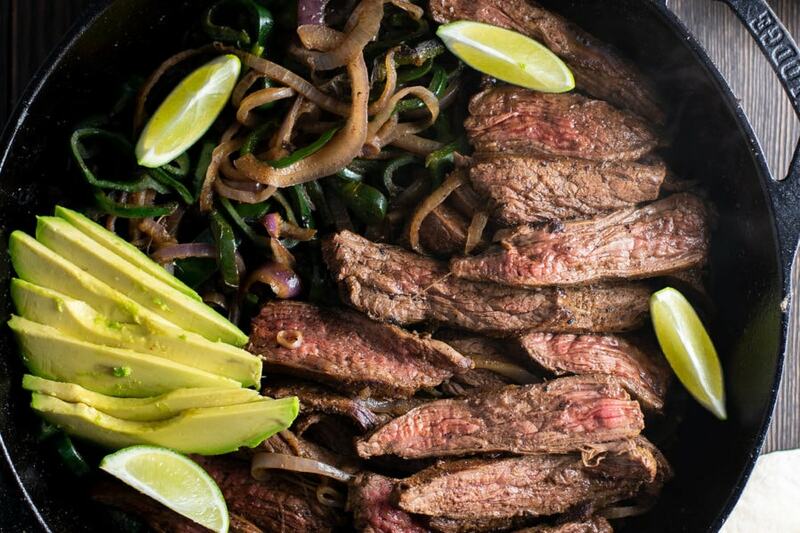 This recipe is ideal for a 12-14 ounce strip steak. Remove steaks from the oven. 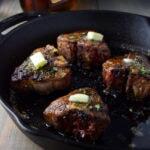 Using a spoon, drizzle the pan drippings from the skillet over each steak. Let rest for 5 minutes before serving. After 5 minutes, your lobster tail should be ready. 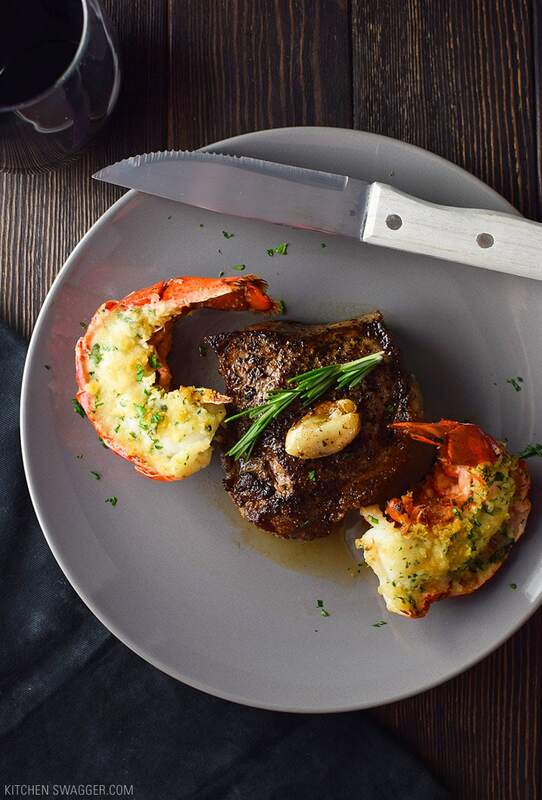 Serve each steak portion with 2 halves of lobster tails. Garnish each steak with a clove of roasted garlic and a portion of rosemary if desired. Looks delicious! Question? Is the lobster tail frozen or fresh? I used to fix surf & turf on New Years Eve – the last time was about 7 years ago. At that time I used frozen lobster tail and they were awful! Tasted like ammonia. I got so turned off I never fixed them again. Thanks Elaine! Hmm that sounds gross. May have been a bad batch. I’m assuming most fresh lobster tails at the fish counter have been previously frozen to store (mine were). 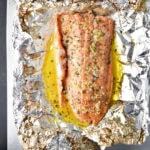 You certainly don’t want pre-cooked, but maybe give another try from a trusted source. If frozen, be sure to fully thaw before cooking. We made these lobster tails this evening and they were fantastic ? Dad, who is not a lobster fan loved them. Thank you! !